Three years ago we launched ProtonMail. Today, we’re launching ProtonVPN. Posted on June 20th, 2017 by ProtonVPN Admin in Articles & News. We’re happy to announce that as of 12:00PM Geneva time today, ProtonVPN is now available to the general public. ProtonVPN is officially out of beta and we are allowing open signups for the first time. BTC payments are now supported in the dashbaord to upgrade your subscription or top up credit (not during signup because of async nature of btc payments). Do you plan server in Czech Republic? When will you be releasing Proton VPN in a native form for Mac OS, and the IPhone? I saw videos on YouTube, showing the native version for windows, and the interface was beautiful, and well thought out. MacOS version is in development right now and will be released before the end of this year. What is this? A VPN service which tells everyone they are for personal integrity with no logs, encrypted connection and using safer countries like Switzerland, Sweden and Iceland but when it comes to payment their customers have to reveal their whole identity? Why not support cryptocoins, bitcoin and more? They have an option to pay with cryptocurrencies. Hello! Yes, we accept Bitcoin payments – please go to http://account.protonvpn.com, add credits first with Bitcoin, and then use them to upgrade the subscription. What exactly does “Country level connection” mean in “Country configs” tab? And what is different from “Connect to a single server in the country” in “Server configs” tab if I have a ProtonVPN Basic subscription? ProtonVPN offers GUI for MS Windows which is very nice, but does not offer GUI for Mac’s. I’m anxiously awaiting for ProtonVPN to offer GUI for OSX, to start using ProtonVPN. I’m anxious to use ProtonVPN when they offer GUI for OSX. How many days does the free account order come in? I can not wait to try? People saying 78 Euros (a year), is way too much to pay for a VPN should think again. How much do you pay for a years worth of cable TV? Watching all those commercials is worse for you than smoking. And what is the most important part of your internet experience? It’s privacy. Just this week there’s warnings about what to “like” on Facebook. And right now, the “5 eyes” surveillance countries are meeting to collaborate on how to crack your internet usage, which is your very *state of mind* as you navigate around the internet. ProtonVPN is worth a whole lot more than 78 Euros a year. Save on something else! Thanks!! Would like to have a dedicated program/ App developed by ProtonMail…. Currently TAP-Windows is installed when we use ProtonVPN on Windows… and iOS/ Androids use third party apps. I just wanna say, I trust no other providers except ProtonMail!!! Do you plan to build an app for the iPhone to make a vpn-use possible for the whole app-traffic of other apps than ProtonMail? Yes, you can already connect on iOS, see here: protonvpn.com/support/ios-vpn-setup. Dedicated mobile clients are in the works at the moment and we hope to have more information in Q4 this year. Are you planning to offer VPN in Poland? I ordered for test ProtonVPN but I have some problems with few services (like Netflix). I did pay when PM still was crowdfunding. I paid when PM was under a ddos attack. I have used your vpn beta version but I don’t pay for your final vpn version. I do not want the free version too…limited. I has hopes that as a paid pm customer you give us a fair price. But with 20% off still €78,00 a year is way too much. Avast offers me a years price of €29,99. Who knows what to believe? This all seems very nice, but if I were the NSA, this is exactly the kind of VPN service I would offer. There is no privacy, no security. Provide any assurance you wish, but there is no way for any of us to know if it’s all just a front. 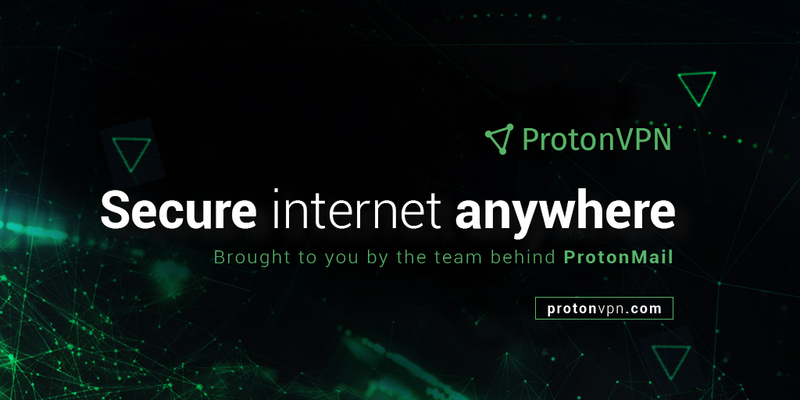 If you don’t just ProtonVPN, then who DO you trust? If ProtonVPN, with all their contributions to online privacy through ProtonMail among many other things, can’t be trusted, nobody can be. You strike me as the kind of person who won’t ever be satisfied. Has the Proton team ever consider making a web browser? It seems like this would be one of the last step in making the internet more secure for Proton users, by ensuring that there are no backdoors and the such. It could not only integrate ProtonMail and ProtonVPN into itself, but make them a pronounced feature. For example, when you start the browser it opens a page that looks exactly like the VPN, except maybe: removing the graph on the bottom, putting the home icon where the graph used to be and putting the search bar between the map and the top of the screen. It would be important to have the VPN integrated with the search function on the home screen, so that every time a user opens the browser they could make the immediate choice of choosing between an insecure connection, a secured connection or a Tor connection; without the hassle of trying to run multiple programs. Also having support to run Tor on the browser (being able to open onion sites) would be a major deal breaker as well. Protonmail would also be one click away on the home screen just like gmail is one click away in the chrome browser; along with any other programs and apps you guys create in the future. Such as a Google Drive like service for paid users. Why protonmail waist its manpower for a thing no one need it?! Almost all boxes ticked, then no Crypto for payments. I use Protonmail for years, I would like to thanks Protonmail team for this amazing mail service. 1) ProtonVPN use 2048-bit RSA for key exchange and not 4096-RSA , and use HMAC with SHA256, Proxy.Sh use SHA512. Do you have a plan to increase encryption to maximum level ? 2) ProtonVPN log timestamp, why log this ?? The account of any user found involved in any of the aforementioned activities will be suspended immediately without notice. Additionally, you may be held responsible for any and all damages incurred by ProtonVPN, including any amounts charged by any outside entity due to said violation(s), including without limitation attorney’s fees and costs. If you really do not keep any logs how will you enforce this? We probably can’t, but the lawyers said we needed to include this anyways. “probably can’t” seems evasive..Would really appreciate if you would confirm if you have capability to keep logs of user activities..
Basically, all VPNs can track and log if they wanted to, but some like ProtonVPN do not do it, and cannot be legally compelled to do it. But that doesn’t mean that it is technically impossible. The threat model explains more. Brilliant response. Do you think more privacy and security centric companies should include the fact that their lawyers put them up to it because some notices and legal documentations can look contradictory and damaging to their products? Well, that’s bad. Some of the things banned are despised pretty universally, but some other (especially bullet point #2, with 9 (!) verbs used to describe banned speech against some protected categories). Even if you can’t apply this in practice, that’s really really bad. …. BUT payment only via Credit Card or PayPal… BUMMER! I’m not seeing a BTC option at the moment, but if you have protonmail you can pay via BTC and bundle in VPN. Not ideal? But it is an option. They support Bitcoin and other cryptocurrencies. There are instructions on how to do so, and they will soon supposedly automate this process. But yes, it is more difficult to use Bitcoin with ProtonVPN and ProtonMail than any other service i have ever used. Would be great if they add cryptocoin like bitcoin and the ability to pay with cash. Posteo do anonymised payments, that could as well be one of the options ProtonVPN/Mail could follow or implement. I know right! If the product is under the same technologies brand why not implement some of the same currency in your other product. Thank you so much for all the good things you are doing for the Internet and for the public! I just followed all the steps to create a new free account. At the end I get a `Direct signup disabled` message. Why? Currently we are over capacity so there is a waiting list to get accounts. Seriously, if you cannot provide a service, I don’t see why you even bother advertising it. What do you mean be “over capacity”? well they are not bound nor obliged to serve every single joe that wants to hook up free vpn. Will you support bitcoin/eth payments soon? I literally have tears in my eyes!!! THANK YOU FOR ALL THAT YOU DO FOR US!!!!! Launch vpn service.. accept paypal and not anyomnous payments – something went very wrong here. Godd job. But what are the differences with TOR? Are native clients coming to MacOS and Unix too or only Windows? Yes, also coming for MacOS and Unix. I saw this in one of the users comments: “Are native clients coming to MacOS and Unix too or only Windows? Yes, it will be forthcoming”. As a Mac user, How will I know when this is available. This info was forwarded to me be a former email user of Protonmail. I did not receive any info about your VPN service before I got his info on your product. If you follow us on Twitter or Facebook, you will see the announcement. We will also email users when it becomes available. Does your VPN service also work behind the Great Chinese Firewall? I’ll be travelling there, soon, and want to check out. Generally VPNs don’t work behind the Great Firewall since they block the servers based off of server IP address. ProtonVPN es el nuevo servicio VPN de los creadores de ProtonMail, el correo ultra seguro nacido en el CERN | Android 3G – ¡Estamos conectados con la Tecnología Android!. I have been using another paid VPN service, but as a Protonmail user I will be changing over to your service as I truly think that I can trust the Protonmail organization. You offer a great service. Thank You. I just wanna say thanx!